What a week it was last week! Thanksgiving is always a crazy time of year, but my dear eldest daughter had to make it more interesting by coming down with a rather nasty stomach bug. And passing it on to my husband and son. Fortunately, the baby and I did not get it. It took a lot of effort to keep things that way. Keeping kids apart who normally play together much of the day is rough, and the baby really loves her Daddy. So what does all this have to do with baby food making? I’m picky about the conditions under which I will make baby food. A house full of people who have been throwing up is not what I consider good conditions. Too worrying that maybe there was something in the kitchen either causing the problem or that had come into the kitchen with one of the sick people. Naturally this hit right when I was just about out of baby food cubes. I’d been planning on making quite a number just after Thanksgiving. I had to resort to jarred baby food! All right, so it’s really not all that horrifying. Glad I had a good stock on hand. I use jarred food for when we visit family. Fortunately, they’re all well and I’ve done some serious scrubbing to be sure that no one spread anything too bad around the house while they were sick. So I’m back to making baby food. And very grateful that whatever the virus was, the baby didn’t get it. Selene is quite the happy little eater, I must say. That girl loves her solid foods. And her breastmilk, although she gets a little creative about the positions she nurse in some days. Gets interesting. But there’s one area in which she has suddenly turned picky. She now really, really needs her food to have texture. 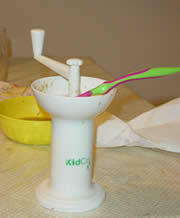 I’m really glad to have my Kidco Food Mill now. That’s it to the right. I was using it to grind up some homemade chicken soup, or at least the solid parts of the soup, when I took the photo. I’ve had this one for quite a while. I used it to make food for my oldest, who is now 7 years old. I used it for my son, who is now 4. And it’s still going strong in making food for this baby. I rather like that it has lasted so well. The food comes out too chunky for babies who are just starting solids, but once they like to chew it’s about perfect in my experience. My kids joke about how pasta comes out looking like little worms, as it still kind of sticks to itself even after grinding. This is the part of feeding a baby where the food mill and my crockpot are really my friends. The food mill because it makes allowing my baby to eat what the rest of the family is eating pretty easy. The crockpot because it means that the meats are tender enough that I don’t struggle so much to grind them in the mill. It’s fun to see my baby eating what we eat. I made homemade chicken soup from scratch the other night because we all had colds. Took some of the soup, drained the broth from it, cooled it and put it in the food mill. Selene loved it! Her appetite had been poor, but that mouth was popping open for this meal. I ended up wishing I had cooled more for her. Had to give her some cereal to finish off the appetite. You do of course have to be careful about food temperatures when grinding food for immediate use. You don’t want a baby with a burned mouth. It is some work to grind the food. You have to push down on the outer section of the mill while turning the crank on top. If the food isn’t tender that can be a bit of work. But to me it’s worth it. Phew! Thought I Killed My Blender! I’ve been working on introducing meats to Selene. Making baby food cubes is a bit harder with meat than with fruits and vegetables. Not only do you have to be very thorough with your cooking, it’s harder on the blender. Even when it’s just ground beef. Amazing how hard that stuff is to puree. My first round with it the blender caused it to quit. Now this is a really good blender, a 15 year old (or thereabouts, my husband has had it since well before we married) VitaMix. That thing blends just about anything. But if you make it work too hard it will quit rather than burn out the motor. I tried it again in the morning. It took some work to get the beef out, as it had become a rather firm, kind of gelatinous mass. Blender couldn’t do a thing with it. But a bit of heating in the microwave on the stuff I pulled out, plus a good bit of water, and it blended up nicely. I’m quite relieved to have not killed my blender. It’s a good machine. My husband campaigns for a newer VitaMix here and there, but while this one works I’m not spending the money. It still does everything we need it to do quite well.